Elizabeth Holmes is a household name in many circles. And not just for making black turtlenecks cool again. Known for being the Founder and Chief Executive Officer of a blood test startup, Theranos, last year Holmes was top of Forbes magazine’s list of America’s Richest Self-Made Women with a net worth of $4.5billion. At age 32 it also made her the youngest. On June 1, 2016 Forbes magazine has reduced Holme’s net worth to nothing. Half of what she is worth is made from her company, Theranos which she founded in 2003. Forbes said private investors had bought stakes in Theranos that implied a $9 billion valuation but said $800 million is a more realistic figure. Over the last year, Theranos became the subject of a series of Wall Street Journal articles and intense regulatory scrutiny. Claims that Theranos has been operating under flawed technology has put Holmes in the spotlight. Currently, Theranos is under investigations by the Justice Department as well as different Centers for Medical services. This is due to the recent lawsuits which have been filled against Theranos accusing the company of offering clients incorrect blood test results. 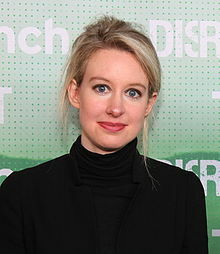 Theranos is a privately held company so Investors of Theranos are entitled to get back their money before Elizabeth Holmes gets her own share and capital of investment. Hence making her worth nothing. According to Forbes, the structure of Theranos’ stock raises questions because despite Elizabeth owning 50% of the shares, investors are more worthy of the company than her because they own preferred stock unlike Holmes who owns common shares. This information came after interviewing various analysts and venture capitalists. However, Theranos claims that the magazine has based its induction from mere allegations.